In the wild rapids of the Niagara River, fearless canoers battle the water and each other to collect gems along the riverbank. Of course, the most valuable gems are found furthest down-river, close to the waterfall. Yes, there is a waterfall, and careless canoers can fall over the waterfall. Also, players must return collected gems to land in order to be counted. At the end, the player who collects the most value in gems is the winner.Players play on a 3D board, representing the Niagara River and the falls. Canoes float down the river as the river flows, but players can row their canoes up-river or down-river to collect gems, to return them to shore, and to avoid the waterfall. This game is great fun for the family, but is strategic and gives players the chance to plan and steal from one another. Most board games attempt to wrap their game mechanics in a theme possessing some degree of verisimilitude. Build a town, feed your tribe, power your cities — these things exist in some form in the real world. Then you have Niagara, where you race opponents to the abyssal edge of a waterfall to wrangle up valuable gems and return them to the goal line. With the specific, controlled environment and contrived system of rules designed to inspire competitive fun, Niagara sounds like a sport. So there you go. Think of Niagara as a board-game version of a sport that does not exist. Each player starts the game with a hand of the same 7 paddle tiles and 2 canoes docked upriver from the waterfall. You play paddle tiles to float your canoes downriver, pick up gems from riverside gem sites, and paddle back to the docking area, with the goal of collecting specific sets of gems. Each round, everyone simultaneously chooses a paddle and sets it on the board facedown. On your turn, you reveal your facedown paddle and move your canoe(s) the number of spaces on the paddle. You can also spend some of your paddle points to pick up gems from gem sites, or drop off gems to free up space in your canoes. Once everyone has played a paddle, the river and any canoes on it shift a number of spaces downstream toward the falls. At the end of each round, all the paddles played that round are discarded facedown, meaning on subsequent rounds you have fewer paddle tiles in your hand to choose from. And at some point in the game, you may find your canoes nearing the waterfall, fighting an increasingly powerful current without the tiles you need to paddle to safety upriver. If your canoes go over the falls, you lose them — and any gems they were carrying. You can spend gems to replace your canoes, but recovering from the setback will prove challenging. Collecting gems and avoiding the falls may seem simplistic except for two things. First, under certain circumstances you can steal gems from opponents’ canoes while they are still on the river. Second, when canoes on the river shift downstream in the river phase, the current flows based on the lowest paddle played. By observing canoe positions and keeping a mental tab of which paddles opponents have played, you can position your own canoes to steal opponents’ gems or play a timely high-value paddle on the same turn as everyone else to flush a few boats over the falls. To win, be the first to collect a complete set of gems: either 5 different colored gems, 4 gems of the same color, or 7 gems of any combination of colors. Smart opponents will each take a share of the closest gems, preventing an easy 4-gem victory. Fighting for 5 colors will usually be your best bet, then, but 2 of the colors lie at gem sites skirting the very precipice of the falls. Instead of risking your own boats for those hard-to-reach gems, you could let your opponents do it … and then steal the gems out from under them just before they reach the docks. What is gem wrangling? The theme of Niagara. What is Niagara? The game of gem wrangling. Niagara totally lacks any real-life approximation of its theme, which means the game is the theme. The rules fit perfectly because the game is the theme. The setting fits perfectly because the game is the theme. Niagara’s game board is a river. You set the board on top of the box, and the waterfall portion hangs over the edge. Plastic discs represent the river spaces. You set the discs on the river, and when the river “flows”, you physically push the rear-most disc which pushes all the discs in front of it down the river and over the falls. Neat! The game board’s river is smartly lined with an extra thick layer of cardboard so the river discs do not slide out of the river section when you push them. Durable plastic river discs and sturdy wooden canoes will survive any number of plunges over the falls. Heavy cardboard paddle tiles and acrylic gems round out the high-quality components, although one wishes distinguishing the different colors of semi-transparent gems was easier. + Watching imperiled canoes spill over the falls and clatter across the table can be uniquely, tactilely satisfying. + Memorizing which paddles opponents have played pays off when you steal their gems or force their canoes over the falls. + Rules and components are tailored to the unique theme. + Short play time and simultaneous paddle selection will not strain your attention span. – Supernumerary rules for canoe movement may send you digging through the poorly designed manual frequently to resolve rule questions. – Distinguishing the colors of the semi-transparent gems proves unreasonably difficult for a game based around tracking which colors of gem your opponents are collecting. – Limited victory conditions leave little replay value. 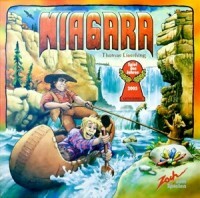 Niagara is an older game but one that still has a lot of appeal for our family. There’s plenty of strategy to challenge a gamer, enough luck to make it family friendly, and for the kids…. well, you get to make the river move and maybe wash Mom and Dad over the waterfall. Niagara is in essence a set collecting game with a pick up and delivery mechanic. The game takes place on a river, where there are different colored gems placed along the path. Using tiles that determine movement (the “dice”), you move your boats up and down the river, trying to collect multiple gems of the same color or a set of different colored gems. Steals are allowed, and the limited amount of movement allowed makes for some interesting decisions. The heart of the game, however, is the river itself. The board is actually placed on top of the box, creating a waterfall at its end. The river itself is made up of plastic discs, which are pushed “down river” at the end of each turn. Players have an opportunity to slow down or speed up the flow, impacting those players that ventured to close to the waterfall hoping to collect some of the rarer gems. Boats that go over the falls are returned to the top of the banks, gem-less. For a family game, the theme is great, and the “take that” elements can be a lot of fun. This is not for a deeply strategic, heavy gaming session, but is one that is still in my family’s heavy rotation after all these years. Add a Review for "Niagara"